A protest over the shooting of an unarmed black man by Sacramento police has ended with at least 80 arrests, police said. Among those detained were clergy and a reporter. More protest is planned for Tuesday, Pete Suratos reports. 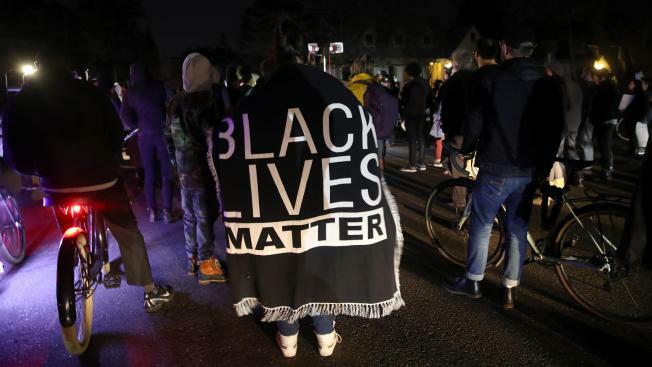 A protest over the shooting of an unarmed black man by Sacramento police has ended with at least 80 arrests, police said. Among those detained were clergy and a reporter. Capt. Norm Leong tweets that the protest Monday night ended with "80 plus arrests. Still processing it all. " Dozens of people staged the march in a wealthy area of the city after prosecutors declined to file charges against police who shot Stephon Clark last March. The officers said they thought the 22-year-old Clark had a gun, but he was holding a cellphone. About 2 ½ hours into the demonstration, police ordered protesters to disperse. Remaining demonstrators were later surrounded on a freeway overpass, the Sacramento Bee reported. Police handcuffed at least three clergy members and Bee reporter Dale Kasler, who was covering the demonstration, the newspaper reported. Kasler's hands were twist-tied and he was led away as other reporters shouted that he was a member of the media on assignment, the Bee said. He was standing with several protesters when he was detained, the newspaper reported. The reporter was released after he had been held for an hour, the newspaper said. Mayor Darrell Steinberg told the Bee in a text message that he questioned the police's response to the protest. "I'm very disappointed that the protest ended the way it did," Steinberg said. "I have many questions about what caused the order to disperse and the subsequent arrests. I will withhold further comment until I get answers to these crucial questions tonight or tomorrow morning." The mayor also told the Bee that he's upset about the reporter's arrest. "No matter what precipitated this order to disperse, no member of the press should be detained for covering a protest," Steinberg said in a phone call to the newspaper.